My girls LOVE pesto. This arugula, basil, and pistachio pesto is no exception. They dip crackers into it, brush it on bread or gluten-free pizza crust and, of course, serve it over their favorite pastas. For years, I thought the only way to make pesto was basil, pine nuts, cheese, and olive oil. I assure you that there are never any pine nuts in this house so that ingredient quickly went out the window and then, over time, I realized that you could put just about anything green in the food processor and make a tasty pesto variation. After one of our recent farmers market adventures, we had way too much arugula to put in our salad so we decided to use some in our pesto. We picked some fresh basil from the garden, found the last of the garlic scapes in the veggie crisper and started adding ingredients to our food processor. 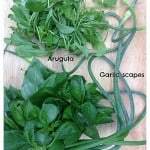 I love garlicky tasting pesto so we usually add a few cloves of garlic but, because we had these gorgeous garlic scapes on hand, we had no need for any additional garlic this time. For nuts, I accidentally bought unsalted pistachios at the store the other day so they weren’t being devoured as quickly as usual. Why not add pistachios instead of pine nuts? Nuts are nuts are nuts. We grated some pecorino romano cheese over everything, sprinkled our greenery with some coarse sea salt, added a bit of olive oil and set the processor to high. Fingers crossed. Lo and behold … in moments we had something that looked and tasted like our standard pesto. We added a little more olive oil and a bit more salt, processed it some more and we were on our way. This green combination will definitely be one that we use again. If you make extra pesto, freeze it in ice cube trays and then store in a freezer bag or freezer safe container – you will be happy to have lovely little rectangles of spicy summer goodness in the middle of winter! 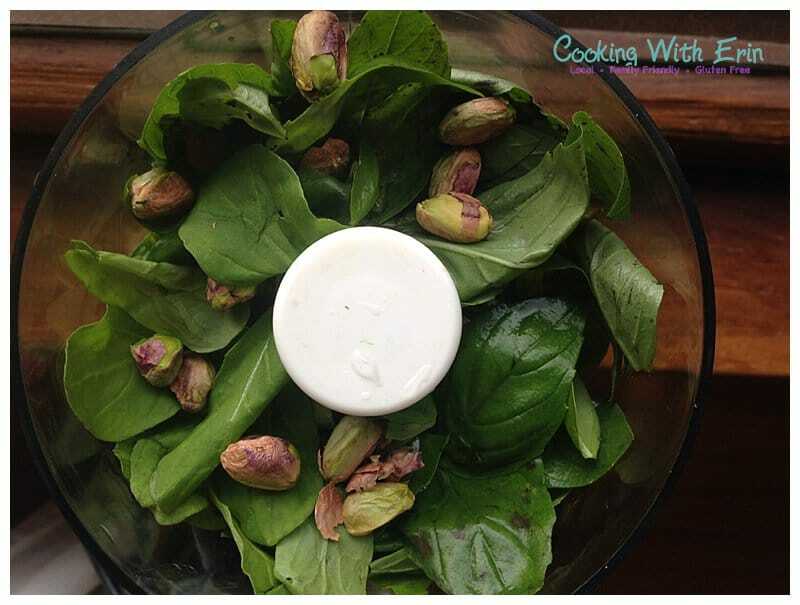 Grab some greens and some nuts and you can have delicious pesto in minutes! 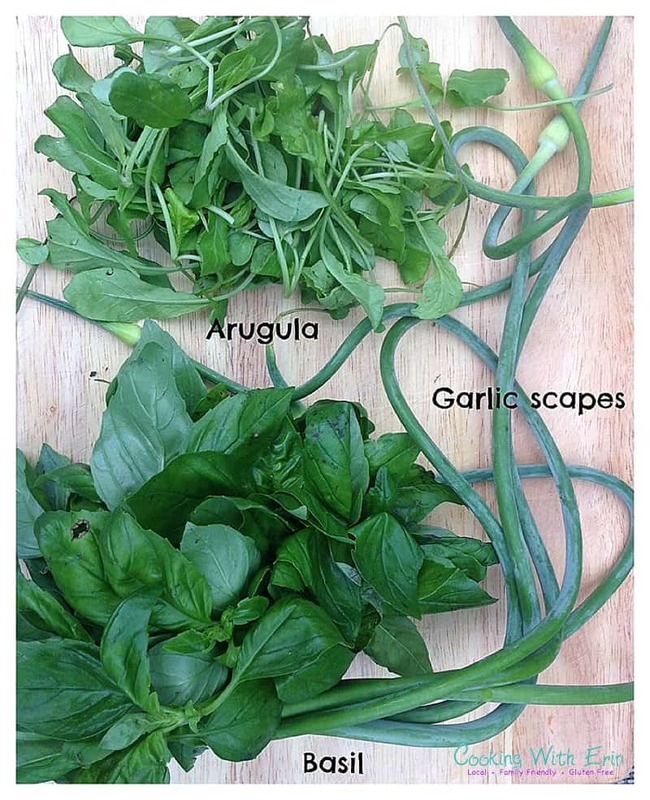 Combine the basil, arugula, garlic scapes, pistachios, and salt in a food processor. Add some of the olive oil. Pulse so that the greens start to combine and liquefy with the olive oil. Add the cheese and some more olive oil. Pulse some more. Scrape down the sides. Taste test! Add salt, if necessary. Add more olive oil until the pesto suits your consistency. Pesto freezes really well! If you have leftover pesto, freeze it in ice cube trays, pop out and store in a freezer bag or other container and use all winter long. You will be happy to get that bright taste of summer in the middle of a long winter!